1) Redmi 3S Prime has a 5 inch HD Display. The display comes with a Reading mode that reduces/prevents eye fatigue by reducing blue light rays from the screen. Also, you can adjust the colour temperature warm, standard or cool according to your preference for a comfortable viewing experience. 2) Redmi 3S Prime has a 13MP primary camera that features a high-quality sensor and 0.1s super-fast Phase Detection Autofocus that lets you capture crisp, clear and quality shots of moving objects. For selfies you have the 5MP secondary camera that comes with Beautify feature that brings out the best in each selfie. 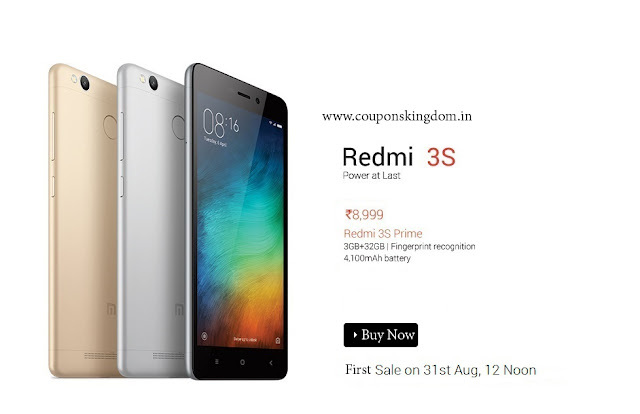 3) Redmi 3S Prime comes with 3 GB RAM, 32 GB ROM and can be Expandable Upto 128 GB. 4) The performance of the Redmi 3S is upped to the max with the 1.4GHz Qualcomm Snapdragon 430 64-bit octa-core processor. Be it while playing games like Asphalt 8 or using multiple apps, the processor's system-level optimizations ensure a seamless multi-tasking all at once. 5) Fingerprint Sensor: Your fingerprint is the key to opening a world of entertainment and performance. By lightly tapping on the sensor at the back, the sensor instantly registers your fingerprint, allowing you to unlock the phone faster and more conveniently than passcodes and pattern unlocks. 6) Battery: Redmi 3S Prime is powered by a 4100mAh battery that comes with a 685Wh/L battery technology for long lasting battery performance. Also, with the system-level optimization of the processor, the phone can last about three days without charging. 7) Redmi 3S Prime supports 4G, 3G and 2G Networks.